This history will be updated with more info on the Eagle line as it is found or submitted to me. 1954 – AMC was formed after a merger of 2 car companies that in my opinion were ahead of their time. These companies were Hudson and Nash. After the merger was complete Hudson’s Detroit plants were shut down and production was consolidated at Nash’s Kenosha Plants. 1955 – Nash and Hudson started selling similar vehicle lines through both Hudson and Nash dealerships. 1958 – By this time both companies carlines were suffering with severely weak sales. So both the Hudson and Nash names were dropped to become AMC and the rambler was the only car left in their lineup. 1963 – By now AMC’s business was picking up and they now had 3 cars in their lineup. They were also the third biggest seller in the U.S. market. The 3 cars in their lineup were the American, Classic, and Ambassador all were variations of the solid and reliable Rambler. The Rambler line was named Car of the Year by Motor Trend for 1963. But things would soon take a major turn and not for the better. The Visionary leader at AMC George Romney Would soon step down to take his place as Governor of Michigan. His replacement did not share his vision for the company and started making larger cars to try and imitate the success of the big 3. As AMC’s cars got bigger their image grew smaller in the eyes of the American market. This was compound by the competitions move to building intermediate and compact cars a market that AMC and the rambler had developed. 1968 – By the late 60’s AMC had went even further downhill. Their engines and cars were outdated and it showed in their sales. AMC’s sales had dropped by more than 50% below their peaks in the early 60’s. So in a desperation move AMC released their first completely new cars the Javelin and the AMX. Sales rebounded as expected as these cars brought the younger hot-rod crowd into the showrooms. 1969 – AMC brought out a limited production SC/Rambler this was the last release of the Rambler in any form. 1970 – Brought yet another new car to the lineup the Rebel Machine and a factory racing program. The racing program paid off as AMC took home some Trans Am Championships in the early 70’s. The 70’s brought about a lot of changes as AMC took it’s place in the new car market. The American public wanted cars that were sturdy and economical and AMC responded with the release of the Hornet and Gremlin lines. These new lines again lured new customers to the showrooms. But federal regulations were knocking at the door and AMC’s technology was not advanced enough to comply. AMC had spent all of it’s R&D money on the design and production of the Matador Coupe and the Pacer. 1978 – AMC brought out what in later years we would find out to be one of their last new cars the Concord. 1979 – We saw the Spirit for the first time. 1980 – We saw the Eagle unveiled and it was the beginning of a new era in the automobile industry. It featured Full time four wheel drive ( which was a first in cars as the Subaru had a part-time four wheel drive unit.) and increased ground clearance. They introduced them in 3 body styles: 2 door Sedan, 4 door Sedan, And Wagon. They also had only 1 engine for their new beast the mighty 4.2L. 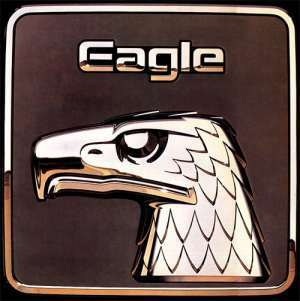 1981 – This year saw a few changes to the Eagle. AMC Added 2 body styles the SX/4, and the Kammback. Also added were the options of select drive, the 2.5L 4cyl. engine, and 4 speed manual transmission. 1982 – All Eagles received select drive. AMC added the 5 speed manual transmission, and towing package. 1983 – The 2 door Sedan, and Kammback were dropped from the lineup. 1984 – The SX/4 was dropped from the lineup. Shift on the fly was introduced as an option. 1985 – All Eagles received Shift on the fly. 1986 – AMC introduced the open differential transfer case. 1987 – In 1987 the only car AMC was still producing was the Eagle and the had 1 more merger to make. The merger with Chrysler brought about the end of AMC. 1988 – Chrysler released the over run 87 Eagles as 88 models. The Eagle line was also dropped. The legacy of the AMC company and it’s cars lives on still today. 1980 contains a story on how the Eagle was developed.